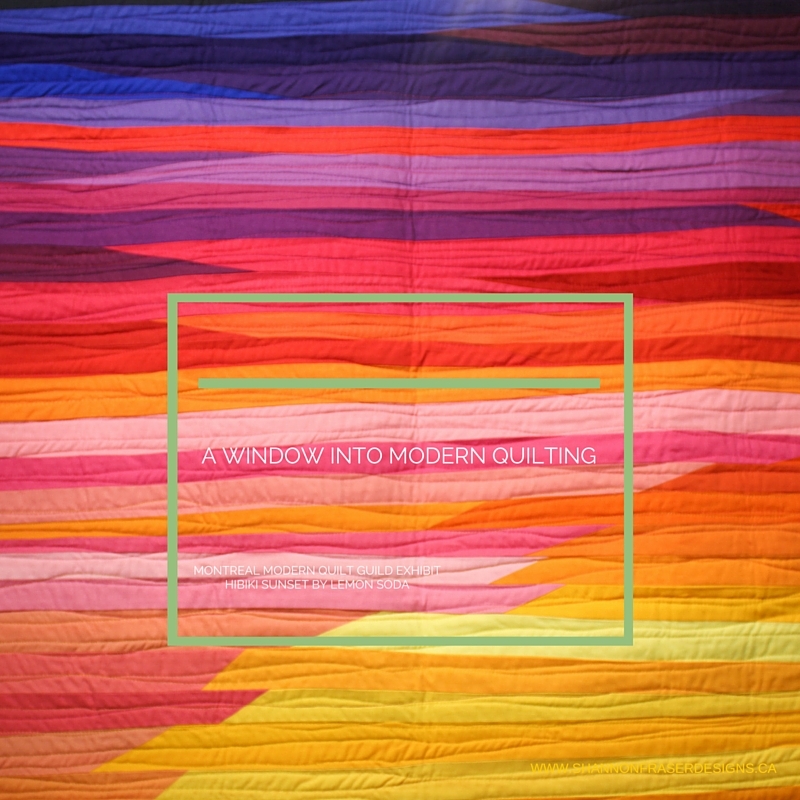 Our modern quilting guild rocks! I made it out for the Windows on the Quilt exhibit last Sunday at Maison de la culture Marie-Uguay and my oh my are they talented!! 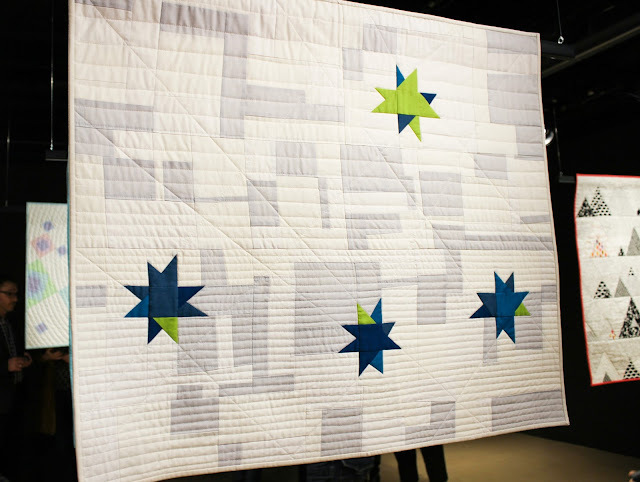 I was thrilled to be able to attend and show support for all the passion, imagination and detailed craftsmanship that went into each of their quilts. 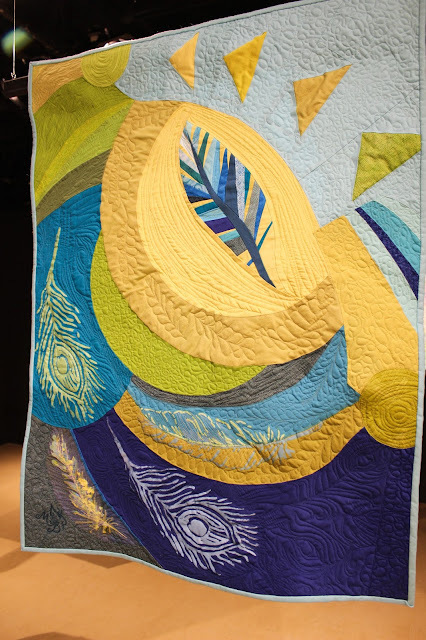 At my first ever sew-in day with the guild, I met Josée who was working on the first quilt you see hanging in the picture above - "Sous une pluie d'étoile". 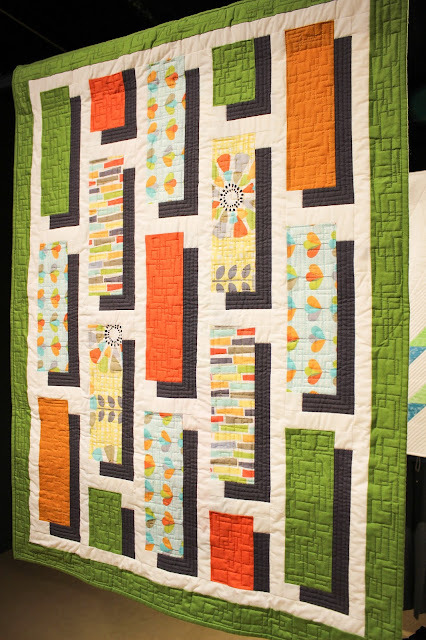 I was so taken with her choice of colours and the geometric nature of the blocks. I fell even more in love with it when I walked in and saw it hanging front and centre! 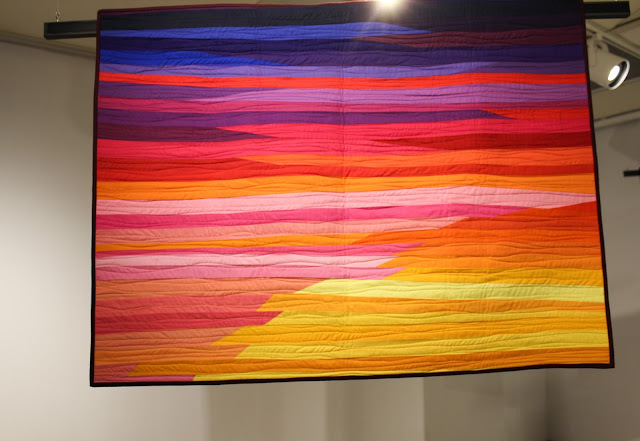 I just adore the "Hibiki: Sunset" by Joanna Lemon of Lemon Soda. The gradient of colours is just stunning and I love the subtle movement captured. 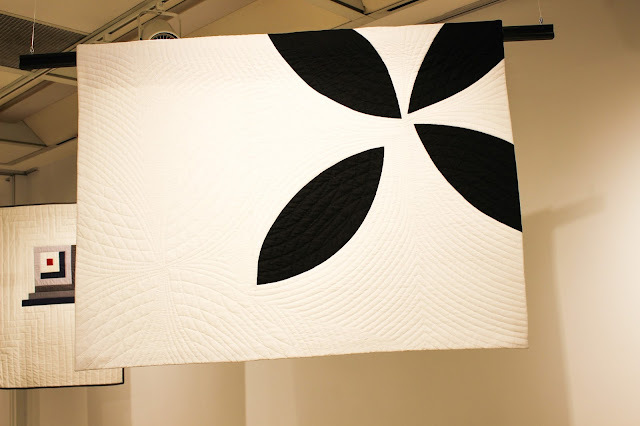 I was completely taken by the graphic nature and simplicity of this black and white quilt called "Holding on and letting go" by Cinzia Allocca. The detailed hand quilting really pops in the empty space. 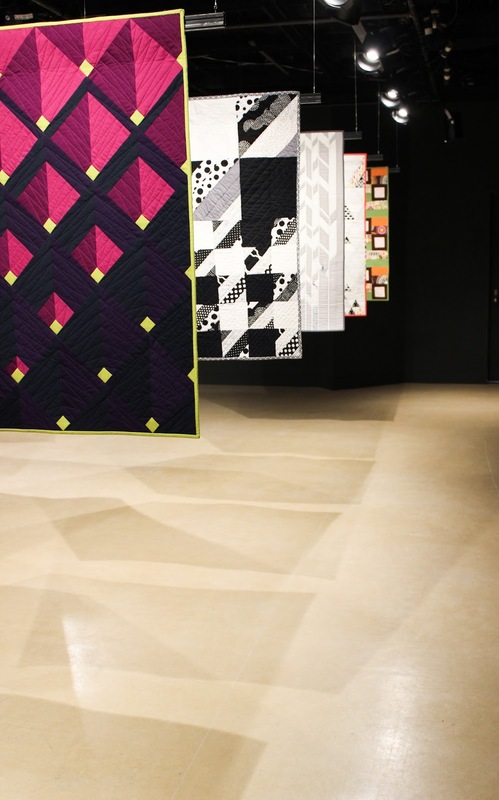 After a walk through of the exhibit, Josée Carrier and Cinzia Allocca, the founders of the Montreal Modern Quilt Guild, gave a presentation on the history of quilting and the different categories that currently exist, as well as, explained the 5 challenges the members were exploring: use of negative space (expansive or creative), minimalist design, alternate grid work, asymmetry and improvisational piecing. 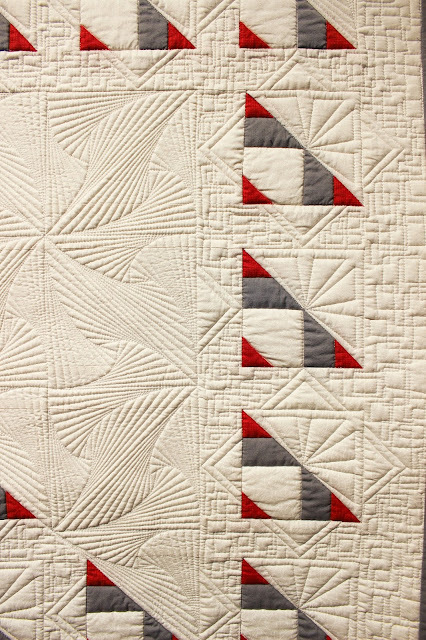 It was such an informative presentation and left me inspired to continue exploring different quilting concepts. 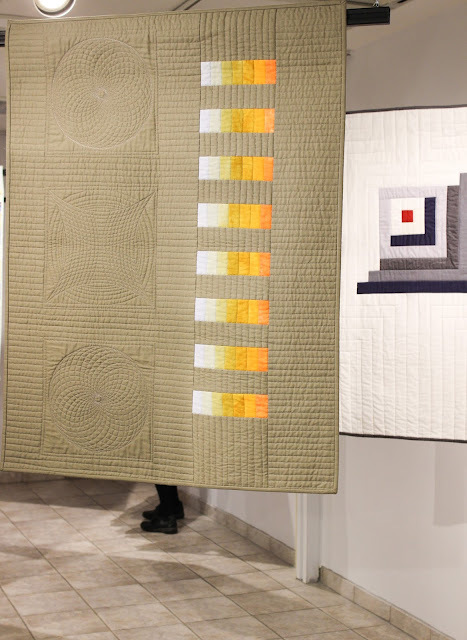 I was so happy for my fellow members to have the opportunity to display their quilts in a gallery type setting. I had seen several of the quilts at our monthly meeting, but it was such a different experience to see them all hung up with a neutral backdrop. I left the exhibit feeling proud to be a part of this amazing community, inspired by the skills displayed and eager to think outside the box and bring my own interpretations to what modern quilting means to me. This is just a quick sampling of the exhibit. 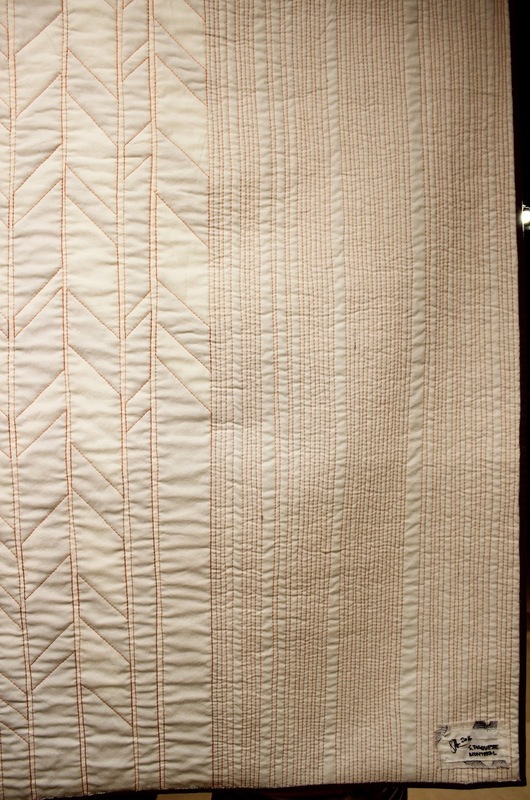 You can view the full picture gallery here. The exhibit is still on display through February 28, 2016 at Maison de la culture Marie-Uguay and it’s one you don’t want to miss! Did I mention it’s free entry?! Thank you for sharing! And for coming to support us. It was thrill to see all the quilts on display. We have some amazing local talent! Thank you, Shannon, for your generous review. I personally was a little overwhelmed by the incredible response to the vernissage, but it was a superb venue, and I am thrilled to be with this wonderful, creative and sharing group! Thank you for coming to support us! I'm thrilled to help support such an awesome exhibit!